Nearly all well water treatment systems require maintenance especially if the water has allot sediment or high amounts of iron. When water is high in sediment, it acts like sandpaper by being very abrasive to moving parts in a water conditioning control valve such as pistons but it can also destroy rubber O-rings. As a well pump system ages, the components of a well tank such as pressure switches and pressure gauges become worn and out of adjustment. It is also very common for the rubber bladder in a well tank to develop small holes allowing the pressurized air out – making the well pump short cycle. These common well system problems have a direct effect on water pressure resulting in clogging of water softeners, water filters, and other water conditioning systems like acid neutralizers. The short cycling of a well pump also wears out the pump motor and will run up your electric bill. Because these problems develop gradually over several years, a busy homeowner may not notice the slow drop in water pressure or the decline in well water quality. With the exception of a bad bladder in a well tank (the tank must be replaced), most water treatment systems can be repaired. Depending on what brand of control head the water filtration system uses, many of the worn out parts can be replaced or most of the system can be rebuilt using new components. Sometimes the reason for premature failure or wear of a system is due to inexperienced personnel incorrectly installing the system or putting in the wrong system altogether. We will get your well water system functioning properly again! 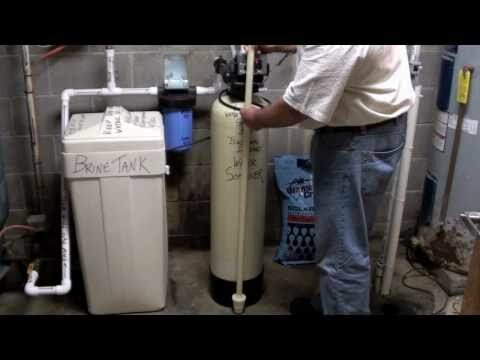 Mr. Water Professional Water Treatment is very accustomed to working on the wide variety of well water treatment systems sold and installed in the Maryland area. We keep parts in stock for most water purification systems or can retrofit your existing system with new components. If the system is not repairable or if the application is wrong we will install the right system at the right price to fit your budget. Call Maryland’s LOCAL Water Treatment Experts for fair and honest service no matter what brand of water conditioning system you have. This is a 64,000 grain water softener (twice the size of a standard unit), using fine mesh polystyrene resin (for better exchange rate kinetics) and manual time clock. This system has a large prefilter that is not in the photo, and was built for very high clear water iron (21ppm). This customer saw one of our signs in the yard of a happy customer in Montgomery County and decided to give us a call. They had a water softener that had been totally disconnected for over 5 years. Also they explained to our service tech that a local water conditioning company had incorrectly sold this unit to the previous owner to combat a severe acid water problem. This is a picture of a rebuilt (large commercial size) 4.5 cubic foot acid neutralizer that we fitted with a new Autotrol 263 3-cycle valve after removing the old Fleck valve that was sticking between cycles. The system had to be completely dumped and refilled because it had not backwashed for a long time.